The undisputed kings of southern rock dish out their third live album as an enhanced two CD set. Fans new and old need to take notice. With their strongest line-up since the seventies and coming off their best studio album in a long time ("Twenty") this collection was almost mandatory for a band whose bread and butter is their live performance. The set is an excellent mix of old and new with cuts from "Twenty" being featured prominently and, of course, many of the classic rockers that first propelled LS to superstardom including "Sweet Home Alabama", "Saturday Night Special", "Free Bird", and "Gimme Three Steps". For the computer crowd the enhanced CD includes the typical pics and bios as well as three complete videos. 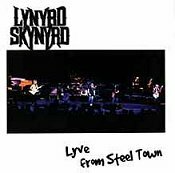 Two are live cuts culled from the accompanying "Lyve From Steel Town" VHS release and one is the production video of "Travelin' Man" which features vocals from the late Ronnie Van Zant mixed with the vocals of his brother Johnny. A touching tribute that isn't in the least bit cheesy.